This year's Electronic Entertainment Expo might be all about the next generation of gaming hardware, but not in Hyperkin's E3 booth: these guys are looking backwards. We dropped by to check out the Retron 5, the outfit's latest machine to traverse the library of older gaming titles. All told, this iteration strolls through half a dozen hardware cycles, offering compatibility for a full nine video game systems. It's more than a simple hardware emulator, however -- this machine offers save states, cheats and visual filters too. Most retro game consoles ape their system of choice by attempting to condense its hardware into a system-on-a-chip. For the most part, this hardware emulation approach works fairly well, but it can present some compatibility issues, and it's not really possible to update or tweak the system after it's been launched. When we stopped by Hyperkin's booth, this was the kind of device we expected to see, a chip-based machine that echoed the company's previous retro consoles. Suffice to say, we were surprised -- in a demo, there was a clear menu system, offering options to tweak aspect ratio, filter overlays, utilize save states and even enter cheats. It didn't take long for a very familiar looking notification window to pop up -- Hyperkin staff wouldn't confirm or deny it, but the Retron 5 appears to be running on a highly customized Android ROM. Mum may be the word on the device's software specifics, but the advantages are clear: this console can receive software and compatibility updates and offers Virtual Console-like features to players using their old game cartridges. 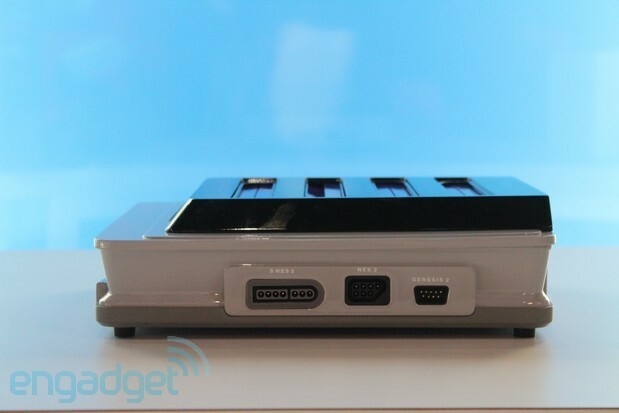 It's a somewhat different approach for a retro console, but it seems like a good one. We spent some time playing around with a prototype -- the final motherboard hasn't been fitted into a functional case just yet -- and came away pretty satisfied. Both Teenage Mutant Ninja Turtles: Turtles in Time and a Harvest Moon title for the GBA ran perfectly on the system, and even looked pretty decent blown up on a 60-inch TV, thanks to the software emulator's various filters. Navigating the system menus, however, was a little confusing -- the vintage SNES gamepad we were playing on doesn't have a dedicated "home" button, so Hyperkin has implemented a series of unlikely button combinations to pull up menus and in game options. Most of these were pretty unlikely to be toggled during a regular play session, but they certainly weren't intuitive. Still, as long as players read the instruction manual first, it shouldn't be an issue. The machine's motherboard may still be going through some revisions, but it's outer case seems to be final. Hyperkin showed is a two-tone plastic shell that invoked memories of the SNES and Sega Genesis. It's a nostalgic design, but the seemingly endless array of ports make it stand out. On top the Retron 5 has four cartridge ports, lining up for NES, Famicom, Super NES and Sega Genesis, while a Game Boy cartridge slot fills out the machine's front. The console's sides mirror each other with controller slots for SNES, NES and Genesis, again, and the left features a USB port for loading updates, specifically. USB gamepads might not be an option, but the machine does have a Bluetooth radio, used by its native controller. Around the back we found power and HDMI out, naturally, as well as an SD slot. Hyperkin couldn't tell us for sure if the SD reader would be accessible in the final build, but hinted that it was considering making the device open source. Hyperkin told us it still has some work to do before the Retron 5 is ready for market, but said that it hopes to release it by the end of the summer. 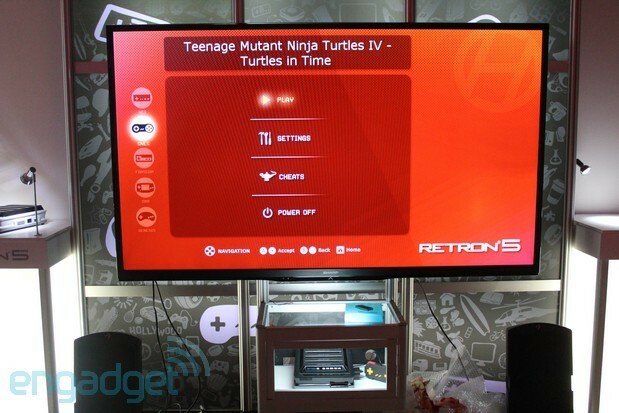 It's certainly not the most powerful console being shown at E3 this year, but it is the most affordable: when the Retron 5 does launch, we're told it'll sell for less than $100.